Write Great Copy That Attracts & Converts For Your Membership Website? 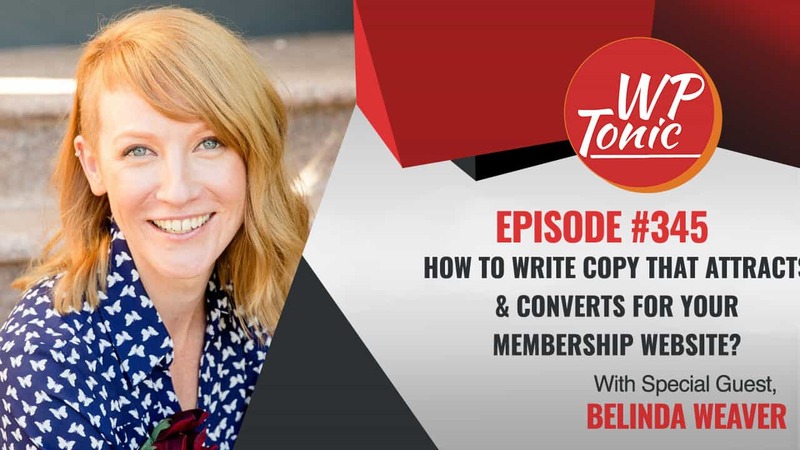 Are You Looking For Advice On How To Write Great Copy That Attracts & Converts For Your Membership/LMS Website? We interview Belinda Weaver. who believe that good copywriting needs to talk to people. Rationally and emotionally. When your words press all the right buttons, they can motivate action. And great copy-writing is all about action. If you’re ready to improve the copy you write, and by that, I mean raising the roof on the results you get from your copy-writing, you’re in the right place. Jonathon: Welcome back folks to the W.P. tonic show. It’s Episode 345. We’ve got a great guest with us. We got Belinda Weave. And Belinda is an Australian copywriter currently living in California. Belinda left her corporate world to become a freelance copywriter in 2010. And after many years as an in demand copywriter switching she switched to teaching others what she knows. So that`s a little intro we`re going to be discussing all things copyrighting around membership sites. And copy writing in general. Belinda thanks for joining the how. Would you like to introduce yourself to the listeners and viewers? Belinda: Thanks for having me on Jonathan. My name is Belinda. I am an Austrailian copyrighter. I’m living in California so I am slowly becoming I’m a little Americanized. Changing the way I’m talking slowly but surely. Yes so I became a Freelance copywriter in 2010. I didn`t actually know that copyrighting was a thing that I do as a full time job. And as soon as I found out within 6 months I ditched my corporate day job. And was my own boss and I can’t imagine doing anything else now. So I’ve been a Freelance copywriter since then and just recently in well guess not that recently now 2013. I did a big pivot to my business. Where I started offering courses and coaching. And I just recently launched a membership site. So my business is evolving all the time. I still sometimes work one to one with clients. Everything is about copywriting, the craft of copywriting, the science a copyright. I really dig it, that’s what I’m all about. Jonathon: That`s great. I got a great co-host Sidney Nicholson. Like to introduce yourself Sidney? Sidney: Sure Jonathan. Hello everyone it is Sidney Nicholson. I`m from the coursewhisper.co where I help entrepreneurs that are running to put an online course together. I help them put it all together. Jonathon: That’s great and I’m the founder of W.P. Tonic. We help membership owners/entrepreneurs looking to build a membership site or learning management system. We also help a lot of companies in the nonprofit sector manage and support their WordPress website. Their membership or their learning membership portal. And before we go into the mind part of the interview I like to just quickly mention one of our great sponsors. And that`s W.P. Fusion. And what is the W.P. Fusion? Well in your technology stack overseas should be using Wordpress for your membership site. But your 2nd stack is your C.R.M. Your customer relations manager or active campaign drip. There’s a host of them even Mail chimp is joining automotive marketing as well. So if you’re using one of those you really, and you got a membership site or e-commerce site. What W.P. tonic does is it enables you to quickly and easily communicate with your C.R.M. It kind a puts it on steroids. And I would suggest you go to the W.P. fusion website and look at their videos of what you can do around. Using their product with a C.R.M. you probably don’t even need a membership plugged in. You can do membership levels by tanking. There is just a host of stuff to do. And what they have offered is a unique discount for W.P. tonic members and viewer`s. If you use the coupon W.P. tonic or uppercase 25 percent of any of their packages. And that is only offered to you my listeners and viewers. And that’s great news. On to the interview folks. So Belinda you know copyright is really important an, I suffer from a little bit of dyslexia so am the worst of it. I invest in quality copywriting. If I am right to myself I have it checked over by a professional copyrighter. But what do you, so I have bought into by a professional copyrighter. But into how important it is. But what you see in general a lot of people, what are the general mistakes people might make when they thinking about copywriting? Belinda: Well, I think firstly everyone can write their own copy. So it’s one of those activities that when you run a business you need to work out what it is that you should be spending your time on. And that it’s going to be most profitable for you. So everyone can write their own copy. We write our own social media updates were we’re all in the publishing model and we’ve all got a published, should have a publishing mindset. But if it takes you too long and if it is just too hard, it is a great thing to give them to a specialist. Because they can do it faster and probably a little bit better. That said, I think, I don’t think people should fear writing copy. Some of the challenges I think people have is this mindset shift that happens when we start to write. We can easily talk to our ideal clients; we can easily talk to our friends. We have great passion and a great conversational tone when we’re explaining what we do and how we can help to the people who need to know. And then we try and put it on paper, whether it’s virtual paper or actual paper. And suddenly we’re writing a high school English essay again. And our brain kind of freezes up. So I think people are intimidated. By the blank page and the cursor. So what that translates to is a very stiff tone of voice. We sound very excuse the jingle jangles my dogs in here. It sounds, it sounds formal and unapproachable and unclear. So some of the challenges people have is getting, clear and simple ideas across in a way that sounds natural and conversational. One of the tips that I give people who want to write their own copy but I really struggling to do it is record themselves talking. Imagine there is a person sitting across from them at the table. And record them telling them about what they do and how they can help and why it’s important and things like that. Because as soon as we start talking about what we do to our, you know, even a pretend ideal client, we relax, we become more natural and our passion stops coming through and we use different words, words that will resonate most strongly without audience. So that is one of the big challenges people face. Another mistake I make is what we do when we write about ourselves. Is we start with what we know and that’s how selves. So a lot of copy we see online and offline is people just talking about themselves. And I totally get it because you think; well I need to tell my customers about me and I, they need to understand what I do. So I need to talk about myself. But the whole shift that a copywriter can bring to a project and the shift that people who write their own copy need to make is that it’s not actually about you, it’s about what your clients and your customers will gain from working with you. So there are two of the big ones. Jonathon: I think they are great points. And before I throw over to Sidney I just want to remark, are you from, applies to the, about us page. Obviously the about, if you’re a consultant. If you are a teacher, got a membership site, your about us page probably is about you. But it shouldn’t be. It should be about what you know, that will help your target audience. Shouldn`t Belinda? Belinda: Yeah, absolutely. And how they will benefit. So one of tips I give, students in my copywriting course and I share as much as possible is what I call the so what technique. So you basically, you explain a feature, you imagine that there’s a stony face customers sitting across from you. And you say, oh, this is what I do. And they say, so what? You say well that’s important because, and then you explain a little more and they say, so what? So you’ve explained a little more and each time you answer that question you hit upon something more meaningful than the answer before. So you need to be able to run through that sequence until you get to benefit to the client that is actually meaningful to them. Jonathon: My last date did that to me. I am sorry I just couldn`t resist it. I am sorry listeners and viewers. That was a bit, totally inappropriate. Thank you Sydney. Sidney: Thank you Jonathan. I totally agree. And I find a copy often ties in nicely to like creating membership sites and online courses. Because it really needs to be about the students or it needs to be about the reader who when you’re either creating content or whether or not you’re creating copy. So, you know, maybe I’m just curious because again, we talk a lot about online courses and membership sites. And one of the biggest okay, maybe biggest is an exaggeration. But the clients that I work with, they often struggle with naming things. What’s the name of the course going to be? And it, it holds them up. Um, they struggle with that much more than some other things. So what, what would your advice be to somebody who’s, you know, creating a course or membership or what have you. And what kind of strategies can you give them to come up with how to name their course? Belinda: Firstly, I invite people to cut themselves some slack because naming products and companies and courses, it’s hard. It’s really hard because it’s not just like, that sounds good, but does it look good? Is the URL available? Is the name already taken? So many kind of, almost technical aspects to the name, but one thing I recommend people consider when they are naming something is what is the aspiration of the audience? Where do they want to end up? Not like if we focus on a problem that is happening now that will get someone’s attention. Sidney: Yeah no, that is so true. And I agree 100 percent, you know, really focused on what’s the outcome, what are the results that they’re going to get from taking the course? And then being super clear. Even some of my clients, they have the name of their course and then they have the modules within it. And then they want to try and get creative even with the names of the modules. I tell them to kind of back off and, be super, super clear because this is almost part of your marketing. Because while, yeah, checking out your course, they’re going to look at what the modules are and they want to see the results that they’re going to get from those modules. So your advice around, you know, be super clear, don’t try to get creative or crafty. Is a really good one around that for sure? Belinda: Yeah. So when I was naming my, I have a private coaching program for copywriters and business writers. And I had to come up with a name for that. What I settled on was confident copywriting. Because that is how I want people to feel when they’re working through the coaching program. So that’s an example of that kind of aspirational, transformative idea in the name. Sidney: Yep that makes sense. Jonathon: Can you give us tips and insights about copy for sales pages and landing pages. Because I know a lot of people struggle with that, Belinda. Belinda: You know what? I think the reason that sales pages can be a little intimidating is more often than not, they’re so freaking long. You look at these, you know, super successful people. And like I, I subscribed to a lot of things because I want to see when things go right live. I want to see what their sales pages have. I want to see what their email sequences contain. And I’ll take a screen grab of the sales page and it’d be like six, you know, the little chrome add on will say, oh, I need to take six images because it’s 10,000 or 15,000 words. And when you sit down and write your own sales page, that’s a really intimidating place to start. But the good news is that sales pages can be constructed and I think that makes them less intimidating. So for example, one of the copyrighting formulas I use as a go to for sales pages is called the PASO formula. Pain, agitate, solve and then I like to add an outcome. So it’s PASO but it doesn’t sound very good. So pain, agitate, solve outcome. So you open with a challenge. You, you want to have one big challenge that your audience is facing right now. Then you can move on to agitating that challenge. You want to be as specific as possible because the more specific you are in pulling out the details of the challenges and their life right now and what’s stopping them from making progress, the more specific you are, the more it will resonate. Then you move onto the solution and that’s when you can present your awesome thing, your course, your membership, your product, anything like that. And then you talk about the outcomes of that and then all the way through. So you’ve got four big categories, sections of your sales page. Then your blank page is busted because even if you haven’t got it perfected, you got four big chunks of copy. Then through each one you sprinkle some testimonials. So when you have your pain and your agitation, you need some testimonials that start talking about, I started here. I never thought I could do this. You know reviews and experiences that tap into the pain that people are feeling. Then through your description of the solution, you want testimonials and reviews that lead people to the outcome. And then of course you want in their calls to action. So every time someone has to scroll on a sales page, you should have a call to action. So for each section is a call to action. For each section there’s a testimonial and then all of a sudden you’ve got chunks of your sales page and it’s all done. And then you can work on finessing it. So starting a sales page can be tough, but I think if you look at it, and this is one of the reasons I love copywriting because it really is a process of construction. You’ve got to understand your audience and you’ve got to understand what you’re selling. You’ve got to understand the transformation that they will undergo, but when you put, when you know those things, putting them on the page really is just a matter of construction. Jonathon: That’s great stuff. Thank you for that. And when we come back, we can be delving deeper in this murky world to get results. We will be back in a few moments’ folks. Advertisement: You want to spend more time making money online. Then use W.P. Tonic as your trusted WordPress developer partner. They will keep your WordPress website secure and up to date so you can concentrate on the things that make you money. Examples of W.P. client services are: landing pages, page layouts, widgets, updates and modifications. W.P. Tonic is well known and trusted in the WordPress community. They stand behind their work with full, no questions asked. Thirty day money back guarantee, so don’t delay. Sign up with W.P. tonic today. That the WP-tonic.com. Just like the podcast. Jonathon: Coming back Belinda as being doing a in a good job of educating us on this world of copyrighting. So Sydney you got a question? Sidney: I do. So you are a copywriter but you also a course creator. And as you know, a number of our listeners either have a membership site or want to create online courses. So maybe you can just tell us a little bit about you know, your experience like you know, why you decided to create a course and what that kind of process look like for you. Belinda: No worries. I started; I decided to create a course in 2013 because I moved from Australia to the US. I had a brand new baby and managing time zones and client deadlines. And a new born baby was a little bit much. So I was working with a business coach and mentor and she said, well, you’re actually running training courses for other organizations. Why don’t you have your own course? What a good idea. So I put the sales page up. I created an opt-in page. People started saying that they were interested in. So that’s a good thing to do before you even start creating the content, make sure people are going to buy it. I launched and I’ve been doing it a two to three times every year since 2013. What of course I have done is I’ve switched client deadlines, for course launch stress, which is a whole different kettle of fish. And I think people think, oh, well I’m going to launch a course and it’s going to be, you know, even cash flow when it’s going to be low stress. And going to throw out the word passive income. And there really is no such thing. I didn’t really think about any of those things when I did it. But in hindsight, I think one of the things people have to think about is how scalable did I want it to be? Because what I did is I created a course I wanted and everything I knew in the course or as much as I could fit in. So I have created rather a big course, my course is really a course for people who want to become copywriters. Now I am going to be creating a mini version of that, for business writers. But I think for people who want to create a course, rather than just jumping in and creating the content, think about who it’s for and think about what they want to achieve and you use that to really direct. And the other thing is, think about how scalable you want it to be. For my course, I include a lot of coaching so it’s very hands on. So I can only accept a small number of people each time I run the course. So if someone wants to earn more money by getting more people to sign up the course, sign up for the course. You have to make it scalable and that means less involvement for you, but you have to make it valuable in other ways. So these are some of the mechanics that you have to consider. We all start from a point of like, I want to share my knowledge with the world and it’s going to be amazing. You know, how big the course is going to be, who’s it for, how many people can sign up for one time? How much work do you have to do for each cohort? Is there coaching involved? And that will determine how scalable it is. And another thing I learned was, and it’s the same with memberships. The biggest reason people quit is because there’s too much content. You give them too much and they become overwhelmed and then they start feeling guilty because they haven’t kept up to date. And then they quit. So that’s something to consider is that’s what ramification and things like that can be really well applied where you motivate people to keep moving through the content. So these are some things that I have learned through running the course. And what I will keep in mind for future courses and what I definitely keep in mind for my private coaching membership. Sidney: Yeah, I think you’re bang on Belinda, in terms of why most people don’t finish the course is because there’s just way too much content. And either it doesn’t apply to the learner or it’s just too overwhelming. And they give up on themselves from believing that they can get through it. So I agree with you 100 percent. So here’s just a follow up question. What skills do you incorporate from your copywriting as you’re creating the course? Like what kind of. Does that make sense? The question, like what? How do you use your copywriting skills when you’re building your course or when you built your course? Belinda: Yeah, absolutely. So there’s a few things. There’s obviously the marketing and the nurturing, so you need an opt in page. You need to sell the transformation. You need to nurture people who were interested so that by the time you opened the course, people are already sold. I want as many people to have already decided to sign up when I opened the cart so that I’m doing as little selling as possible once I’ve opened. I’m just trying to get the maybes to get more interested. Now when it comes to the actual course content. I use a lot of my tone of voice experience. So I want my course when it’s red to sound like me. I want every touch point with my course content being the video or the PDF lesson. Or the emails they get all the coaching in the Facebook group. I want it to have a consistent tone of voice and feel. And that’s why for me having, I write. When you read something I’ve written, it sounds exactly like me now. Only it’s had to proofread his touch so it sounds a little better. The other thing I use when I create my content is formatting techniques. So have short paragraphs. I have subheadings; I use graphics and little icons and things like that because I want the content to be visually appealing. I want it to be digestible and that’s where short paragraphs and subheadings work to break up the eye as people move through the content. So they’re big things. I also, instead of calls to action in my content, I have things that people; I liked people to reflect on something. Or I like people to take a moment to do something and things like that. The more people you can get people to do or think, the more they will make progress and the more connected there’ll be with the content. Jonathon: Is it me Sidney? Sidney: Yeah it is you Jonathon. Jonathon: I think you’ve covered some of this stuff on the questions I was going to ask you actually Belinda. But because I’ve worked for some organizations. You know around 100 – 150 people organizations and they’ve said what about the copyrights? Who’s going to write the content? Oh, we are going to write it. We got Susie here who’s got AMI in English. And of seeing and off she goes and comes back the copy and it’s like world peace. And I think my vocabulary is reasonably sophisticated. Like I’m reading get the dictionary out for every fourth word because I have no idea what these words are. Do you think that’s quite cobbled actually? Belinda: There’s also a thing when I’ve worked with clients where they’ve said, oh, I love the copy and I’m just going to give it to my partner, wife, boyfriend, husband, cousin. Because they know a little bit about marketing. So a lot of people get lumped with reviewing or writing copy who aren’t in the right head space for it. When we’re talking about over complicating copy. I actually just did a little YouTube tutorial about readability. Because a lot of people think that the more complicated the language that they use, the smarter they sound. And the smarter they sound more professional it is and the more impressive it is. And like we don’t want to dumb it down too much. And one of the conversations I’m often having with clients is straightforward and clear is not dumb. It’s important to be straightforward and clear. No one ever said this copy is way too readable. I had no problems understanding this at all. You know, that’s never a challenge. So one of the tools I’d like to use is there several readability tools that you can get online. There’s readable IO and there’s even an app called the Hemingway App. Which will help you identify passages in your copy that are too complicated, that are unreadable? The readable IO, I think it’s readable IO or its readability IO. Basically that will give you a great score on the writing that you’ve done. And all copy should have an elementary school or primary school. As we say, grade school level, the highest education level of the person reading the copy. The higher education level needs to be the harder it is to read. So if you want to make your copy more readable, you need shorter sentences and less complicated words. And you know, the beautiful thing about English is sometimes there is precisely the right word that you need. So you don’t need to use uncomplicated language in every single instance. If there is precisely the right word to use, use that word. But a lot of people like to add some hot air and fluff, you know, we’re talking about utility not use. In other words, instead of you, it’s just, there’s lots of ways that we can, we use longer, more complicated language because we think it makes us sound smarter and more professional. And it’s just not necessary. And I think great examples are software companies, software as a service. Any software company that’s really, really big these days. You go to their website, very simple, straightforward language that is all about how customers will benefit. They’re great examples of just making it clear and straightforward. So if ever you feel like the wonder if this is a bit too complicated, plug it into a readability tool. Word even has a readability tool. It will give you a great score in word. If it’s high school level, try and make it clearer and more straightforward. Jonathon: We actually have to wine up. Jonathon: But Belinda’s going to be staying on for a little while, which you’d be able to watch on the WP Tonic website and YouTube channel. And she’s going to be discussing how sending one email a day as helped her building her business, which was a bit catcher intuitive to me, but she swears by it. So was going to have a discussion on that. So Belinda where can people find out more about you and what you’re up to? Belinda: My website, my business is called copyright matters. My website is copyright matters.com. That’s basically where I have. I have free courses, I have my daily copywriting tips, I have a blog, there’s tons of free content and I also have some mini courses that are free. I have my big copywriting course and there’s lots of other things that you can get more involved in coaching with me. But there’s also tons of free stuff on there. And if people look for me on social media, I’m on social media way too much. So, yeah Facebook, twitter, LinkedIn. They’re too much. People can find me. Look for Belinda Nueva. I’m ginger, I’m a copywriter. You can’t miss me. Jonathon: There we go. Ginger spice. Sydney how can people find out more about you? Sidney: Alight, so if you’re looking to create an online course and need help in terms of crafting that message or in order to keep it short and simple for your students to understand, you can reach out to me at coursewhisperer.com. Jonathon: And folks if you are looking for help. 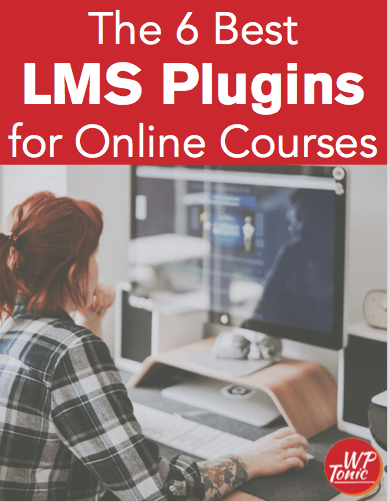 If you are a developer or WordPress consultant and you’re looking to build some custom functionality for your WordPress learning management system, and we are the folks to help you. If you are too busy to maintain your WordPress membership site or learning management system, we’ve got a service and a product for you as well. So just contact us and we’d love to help you and give you some free advice. We’ll be back next week with another expert, hopefully giving you the knowledge you’re looking for around your WordPress membership website. We’ll be back next week, folk’s bye.